Eveline Pupeter, CEO of Emporia, shows two of the company's basic models at their booth during the first day of the 52nd edition of the IFA trade fair in Berlin on August 31. High-tech gadgets to make the lives of senior citizens simpler, safer and more fun are in the spotlight at the world's top showcase for consumer electronics and home appliances. High-tech gadgets to make the lives of senior citizens simpler, safer and more fun are in the spotlight at the world's top showcase for consumer electronics and home appliances. A jump in demand has prompted organisers of IFA, which opened its annual six-day trade show Friday, to offer their first guided tours for the over-60 set, pointing out what's new and hot for the market of a certain age. Displaying their latest gizmos, a raft of companies hope to impress at the Berlin fair, in a country which, according to Eurostat last year, had the most inhabitants over the age of 65 in Europe. Mobile phones with bigger buttons, robotic vacuum cleaners that will not give you backache and the latest in hearing aid technology feature on the tour, amid smart TVs, tablets and high-end coffee makers. "The elderly like to sail, play golf, work in the garden," Eveline Pupeter-Fellner, chief executive of Austrian company emporia which specialises in mobile communication for seniors, told AFP. She shows off a robust mobile phone for the outdoors which is also waterproof—others in their range have features such as being able to pinpoint the location of the user, a torch or an emergency call button. 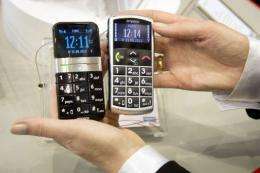 But a simple alarm clock tends to be the most important feature for older mobile phone users, she said. 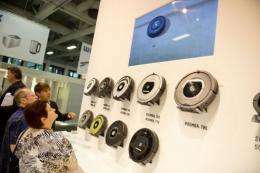 A group of 60+ visitors watch a range of domestic cleaning robots at a booth during the first day of the IFA trade fair in Berlin on August 31. High-tech gadgets to make the lives of senior citizens simpler, safer and more fun are in the spotlight at the world's top consumer electronics' and home appliances' showcase. Beate Munkelt, a dentist from Muenster, who admits she is still a couple of years off from turning 60, is visiting the IFA for the first time and is on the tour with husband, Andreas, also a dentist. "Very practical, elegant, user-friendly," she said approvingly at the emporia stand. When her husband was looking to buy a new mobile phone, it had been difficult to find a model that was easy to use and not overloaded with extra features he did not want, she had earlier complained. Seventy-year-old former pediatric nurse, Barbara Mueller, from near Berlin, said that although she was not looking to buy anything, she had joined the tour because she was curious "just to see what's new". Dirk Koslowski, IFA project leader, said the daily two-hour tours for seniors were introduced due to "increased demand" and the show wanted to cater for every age group, not only presenting but explaining new trends. "It's a very important market and it's growing," Markus Schmitt-Fumian, senior vice president of business development at Germany's Gigaset, said, stressing however that a product's design should not be sacrificed over usability. 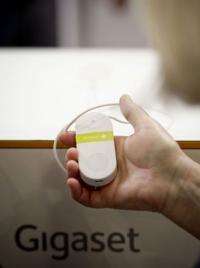 A 60+ visitor holds a panic button device at the Gigaset booth during the first day of the IFA trade fair in Berlin on August 31. High-tech gadgets to make the lives of senior citizens simpler, safer and more fun are in the spotlight at the world's top consumer electronics' and home appliances' showcase. The company had learned that a device should not "look like a medical device", he told AFP, adding: "Design plays a major role because it's not the 75-year-old who is setting up the phone, it's their daughter or son." And it was not just greying consumers using the products either, he added. Often they were bought by younger customers because they were quicker and easier to use or were more robust for a workplace. The company shows the tour a small device which it plans to launch next year—an emergency button for hanging around the neck, which dials pre-programmed numbers when pressed and even raises the alarm when its wearer has not moved it for a while. Thomas Katlun, who handles public relations for the German distributor of US-based iRobot, also stressed the importance of the seniors market and predicted that 'care robots' to help the elderly with the use of a tablet computer were not far off. "Not C-3PO (the robot character from "Star Wars") opening tins or whatever, but assisting in communciation ways. It sounds like science fiction but it's not that far away," he said.